News - What's going on in support of Dads, Parents and Families? Join us for an evening of learning about FathersNM and of celebrating some of the inspiring dads we work with in Central NM. Have you heard of this group? New Mexico Men's Wellness is a community of men dedicated to an evolution of our concept of masculinity towards respect, nurturing, and honor. This group welcomes all men to participate in their many activities and will support men in connecting with a small men's group for ongoing support (similar in concept to FathersNM's Dads Groups!). Find their website by clicking here. FathersNM staff members Barry, Gabriel and Johnny were able to attend the annual NM Men's Wellness conference at Ghost Ranch this past October. Wow. What a powerful gathering. AND, NM Men's Wellness has been an instrumental support to FathersNM since the beginning. Thank you men... for so much. 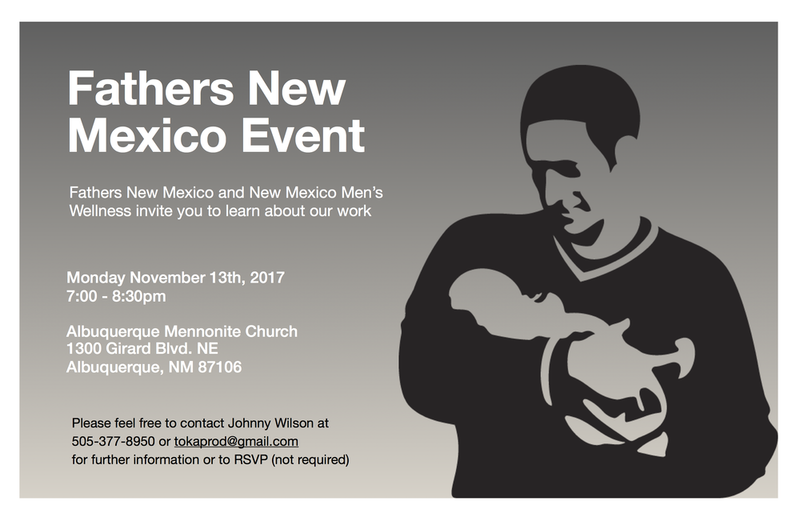 Fathers New Mexico will host a SE Heights Dads group. The first weekly gathering is this Friday the 8th of September! These groups will be at 6pm to 8pm at the Sundowner Community Room (6101 Central NE). All dads are SO welcome!!! Come celebrate being a great dad, and connect to support. We can't wait to see you!!! There are ways in which family/society/cultures stifle men. I found this article to be a profoundly interesting insight into ways men are hurt... And possibly a contribution to how, as a consequence, men are less capable and more inclined to hurt others. Read Why Do We Murder the Beautiful Friendships of Boys? Click oaths interesting article. She raises some very good points. And, more to the point, the scholarly article about the "meta-analysis" she is referencing is thorough and thoughtful. Not short, nor easy to read, it has lots of things to think about. Scary Mommy published a fun piece about the science behind having dad do the bedtime story. Go ahead, read it by clicking here. And whether you are a mommy or a daddy, enjoy the bedtime story. Or, the nap time story. Nothing could be further from the truth. Dads are devoted, like moms. Dads want to be with their children. If we observe significant amounts of separation of dads from their children, we need to look into that. It appears that ETR (Education, Training and Research) is opening up these questions... take a look at this article they published. They have done a great deal of work in the areas of the sexual and reproductive health of young people and it is gratifying to observe that they are looking at young fathers with a desire to understand, rather than assume and judge.